Surgeon (Pediatricians, Anesthetists, Gynecologists) and Staff Nurse Jobs. 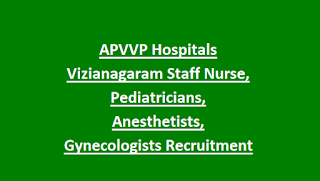 There are total 32 vacancies in this APVVP Hospitals for Vizianagaram District DCHS Recruitment 2018. Last date for submission of application form to DCHS Vizianagaram is 08-10-2018. Application for is available for download @ http://www.Vizianagaram.ap.gov.in. Candidates will be selected based on merit in educational qualifications and reservation for this APVVP Hospitals of Vizianagaram DCHS. 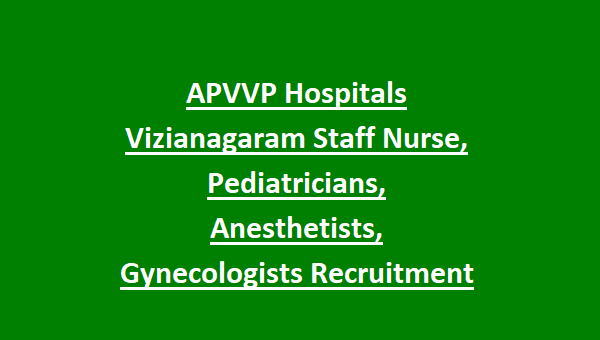 More details related to this APVVP Hospital Staff Nurse, Civil Assistant Surgeon jobs recruitment educational qualifications, age limits and other details are given below. There is total 91 vacancy in this DCHS Ananthapuramu APVVP hospitals Recruitment 2018. Specialist Doctors and Staff Nurse. Upper age limit is 18-44 years for this APVVP Hospitals Staff Nurse, Specialist Doctors Jobs. For SC/ST/BC and pwd candidates age relaxation applicable as on 01-09-2018. For Staff Nurse Jobs-Must have qualified intermediate with GNM course or B.Sc Nursing. And must have registered with AP nursing & Midwifes Council. Remuneration will be given as per the new norms of Contract employees which is approved by The Commissioner APVVP Vijayawada. For Civil Assistant Surgeon-90 Marks will be given for MBBS Merit and 10 marks for PG course and experience. Interested and above said qualifications having candidate may apply for this Andhra Pradesh Vaidya Vidhan Parishad Hospitals under DCHS of Vizianagaram Staff Nurse and Civil Assistant Surgeon Jobs.